Katharine Lewis, associate professor of biology in Syracuse University’s College of Arts and Sciences, aims to systematically identify genes that instruct spinal cord nerve cells (neurons) to develop into specialized cells that are critical to walking, running and countless movements most people take for granted. It’s a novel area of research for which the National Institutes of Health awarded her a $405,750 exploratory/developmental research grant. NIH exploratory grants are intended to encourage novel research that breaks new ground or extends previous discoveries toward new directions or applications. 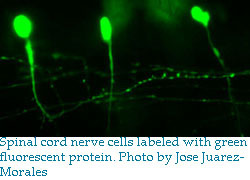 Spinal cord nerve cells acquire characteristics that are specific for particular functions. Some cells specialize in gathering sensory information (touch, pain, hot, cold), while others specialize in movement. Those that control movement include motor neurons, which tell muscles to contract or expand; and interneurons, which process information related to movement and locomotion. In effect, interneurons are the local computers for motor neurons. Lewis focuses on the characteristics of five distinct interneurons that specialize in regulating movement. She is trying to identify all of the regulatory genes that are turned on in each of these interneurons and test which of these genes instruct the cells to develop specialized characteristics that determine how the interneurons communicate with other cells. Lewis was appointed to the college’s Department of Biology in 2010. She also holds an appointment in the Graduate Faculty Organization at the State University of New York Upstate Medical University. Prior to her SU appointment, she was a Royal Society University Research Fellow in the Department of Physiology, Development and Neuroscience at Cambridge University in the United Kingdom. The highly competitive fellowship is awarded to outstanding, early- to mid-career scientists who demonstrate a potential to become leaders in their field. Lewis holds a Ph.D. from University College of London, and has been a fellow of King’s College, Cambridge. Other honors include a National Endowment for Science, Technology and the Arts Crucible Fellowship; a five-year term as an elective committee member of the British Society of Developmental Biology; and a Wellcome International Prize Traveling Research Fellowship.